Leucojum aestivum with its green dots on white bell shaped flowers is a welcome addition to the winter garden. Flowers appear on tall spikes to 30 cm in height. They are a bulb and are native to Europe. Only 2 species with green dots ( L. aestivum and L. vernum ) are still left in the Genus Leucojum, with all of the others now in the Acis genus. With species that flower at different times of the year Leucojums grow well in climates from cool through to temperate. A woodland plant, they are seen as an old fashioned cottage garden plant, we think they provide interest in the garden in spring and are easy care bulbs that deserve more recognition. One of the popular varieties is L. aestivum (aestivus) ‘Gravetye Giant’, larger flowers than most and easy to grow. A native of Europe. Species include Leucojum aestivum or ‘Summer snowflake’, Leucojum vernum is the ‘Spring snowflake’. These are a tall growing relative of ‘Snowdrop’ or Galanthus. Leucojum aestivum will grow to nearly 2/3m and flowers in late spring. Grow them beneath deciduous trees, where they add some brightness in the cooler months. Or plant them in clumps in the perennial border where they add interest while other plants are dormant. 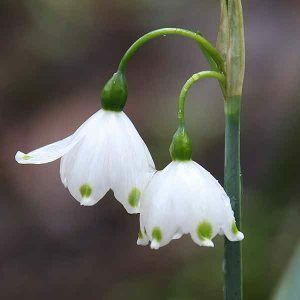 Leucojum autumnale ‘Autumn snowflake’ a tussock forming perennial is now Acis autumnale. Best planted in autumn these are a bulb that require a cool to temperate climate. They are a woodland plant and will slowly spread and naturalise in good conditions. Plant bulbs in a humus rich soil, well drained. Full sun to dappled shade. Bulbs can be planted at around 8cm deep. Water in well with a little liquid seaweed fertiliser. They do not need to lifted every year – however can be divided as clumps become congested. After flowering, leave the foliage to die back naturally. Propagation is easy by dividing established clumps in late summer.